Marc Bekoff, professor emeritus of ecology and evolutionary biology at the University of Colorado, Boulder, is an internationally acknowledged expert on animal behavior and cognition. 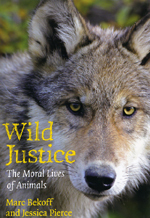 In 2009, the University of Chicago Press published Wild Justice: The Moral Lives of Animals, a book he coauthored with Jessica Pierce, which uses cutting-edge developments in psychology, biology, and cognitive science to demonstrate the broad repertoire of moral behaviors and nuanced emotions exhibited by animals. Recently, Bekoff was a guest on ABC News with Diane Sawyer, where he contributed to a feature about service veterans reuniting with their companion animals. The juxtaposition of Bekoff’s commentary, which was fed into the segment via video chat, with the documentary footage of dogs greeting their returning owners in backyards, airports, and living rooms, illustrated another angle of Bekoff’s research: animals are sentient, social beings, capable of developing deep bonds—the experience of which clearly transcends even technological mediation. Bekoff recently commented on Pierce’s forthcoming book The Last Walk: Reflections on Our Pets at the End of Their Lives, which combines wrenching personal narratives and scientific research to consider a wide range of questions about animal aging, end-of-life care, and death. “Decisions about how to treat an animal toward the end of her or his life are among the most difficult we have to make and it’s our responsibility to do the best we can. Our companions trust that we will have their best interests in mind,” Bekoff said. Lucky for the rest of us that Bekoff and Pierce have dedicated their lives’ work to helping us recognize our relationships with—and responsibilities toward—our fellow animals.